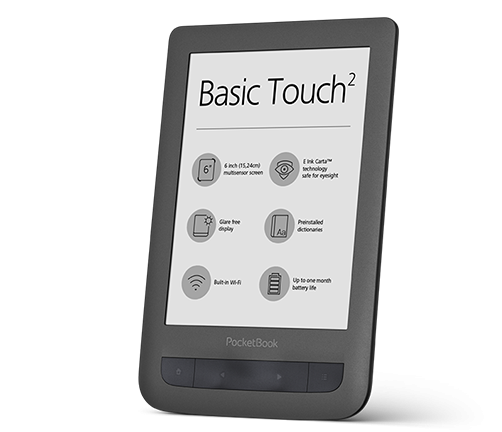 Simple and easy in use PocketBook Basic Touch 2 has all basic features for the most comfortable e-reading. The device received a touch-screen E Ink Carta™ with a resolution of 800x600 pixels. With more contrast black color and whiter background, the screen optical properties are even closer to the classical paper page. Due to E Ink Carta™ technology the device will provide excellent e-reading experience to a user – the screen doesn’t glare in the sun, doesn’t reflect any objects and is perfectly safe for eyes. The new device is implemented in classic PocketBook design and will be available in black color. On the front panel the ergonomic mechanical paging buttons are located. PocketBook Basic Touch 2 weighs only 180 grams, which makes it quite portable and convenient to use anytime and anywhere – at home, in office or “on the go”. PocketBook Basic Touch 2 - simple, comfortable, without compromises! 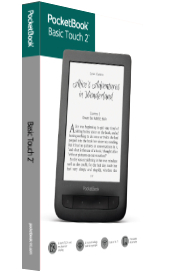 The e-reader provides maximum freedom choosing e-content – PocketBook Basic Touch 2 supports 18 book- and 4 image formats (JPEG, BMP, PNG, TIFF) without converting. The built-in dictionaries will be essential for the foreign literature reading. A powerful processor with 1 GHz together with 256 MB RAM provides smooth turning of pages and quick response of any application. The new e-reader got 8 GB of internal memory (up to 32 GB), that allows to store a wide mobile library of more than 2000 e-books. Built-in wireless Wi-Fi module with preinstalled services Dropbox, Send-to-PocketBook and PocketBook Sync give opportunity to transfer e-content instantly on the device without having connection to a PC.